At the Association of Woodturners of Great Britain International seminar held at Loughborough University this August, these pieces were chosen in the top fifty turnings and will be on display at various shows over the next 12 months. “The wood was acquired three years ago from a garden in a local village. It was a wonderful old tree, but too near the house and it had to come down. I was with the professional tree surgeons when the tree was felled and could see the potential in the base of the trunk where the figuring was beautiful. While the wood was still wet and full of sap I turned it into thick –walled bowls using a Kel McNaughton bowl centre saving tool. 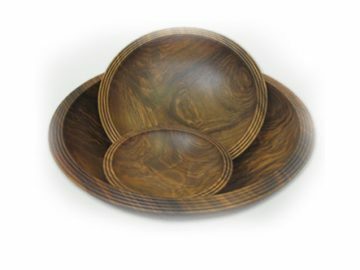 This way I could make three bowls from one piece of wood. These I placed in my store and air dried for two years. They were then rechucked and returned to the lathe. I beaded the underside of each bowl and left the inside smooth to show the figuring. This way hands have the enjoyment of feeling the texture when the bowls are lifted and the eyes see the beauty of the grain, colour and figuring inside. I fashioned a beading tool out of an old carbon steel gouge on my grinder and kept it razor sharp with a chainsaw file. It worked well particularly when I used paste wax on the wood first to fill the grain and lubricate the surface.